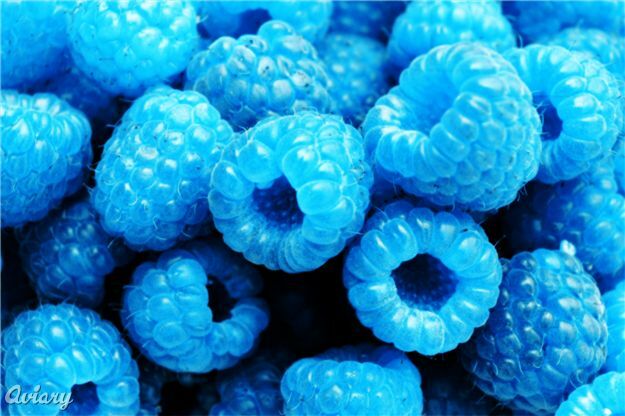 The World As I see It: Is Blue Raspberry a Real Fruit? Where does it come from? Is Blue raspberry a real fruit? or is it some hybrid flavour? and if it is a real fruit where does it grow? It is not a real fruit. It it an artificial flavor. Here is more information. "Blue raspberry is a common flavor for syrups, candies, and other food items. It is derived from the juices of the Rubus leucodermis plant, otherwise known as the whitebark raspberry. The artificial blue raspberry flavor, originally derived from blue whitebark raspberry fruit juice, became an artificial designer product in the late 1950s. The flavor is described as somewhere between tangy and sour. It is often accompanied with blue food coloring; the coloring of blue raspberry also helps it to be differentiated from strawberry flavored drinks. The use of food coloring often dyes the mouth blue temporarily. So after reading this I needed to figure out what this 'white bark raspberry' is. So I decided on yet another trip to google images. Blue raspberry is a common flavoring for candy, snack foods, sweet syrups and soft drinks. It is more commonly used in the United States, as a sweet flavoring. The flavor originates from Rubus leucodermis, more commonly known as the "Whitebark Raspberry" or "Blue Raspberry" for the blue-black color of its fruit. Well I think we can call it official. Blue Raspberry flavor comes from the Rubus leucodermis plant. Do you have any questions you want to know the real answers to? You can comment them if you want to and I will try and give you the answers like I did today. Excellent investigating into this blue raspberry problem! How is cashmere made? I know it begins with the beard of a mountain goat, how does it transform from a scraggy goat beard to a fashionable v-neck sweater? Of course this is the question you ask Dani! Well I said I'd answer any question. I shall post it later today. Why isn't there a White Lemon flavour? Thank you!!!! I didnt know about this! Place random racist internet comment here. So are blue raspberries real?? There must be a law involved in the misnaming of blueberry candy, etc., for blueberry, as the mythical blue raspberry You will see, this is no trivial matter. The sin of Gommorah was: Before I was converted to Christianity, I was a Third Degree Witch (the highest real degree) and the High Priest of my Local Coven. We were Black Left Hand Path so that our only secrets were names & places. We reveal what the White Right Hand Path suppresses. THEY suppress anything associated with vagal stimulation, the most efficient way to enter the Underworld. “You cannot enter the Underworld without the Golden Bough (the vagus nerve)”- Virgil. Even blueberry candy was unavailable until recently. There are the Three Levels. The first is euphoric and is sought by practicioners of “the choking game”, and “sexual asphyxia”, that was called “Gomory” in the original Book of Jasher. Blue lips: blueberry candy; see the connection? When you stimulate any part of a kind of nervous system that stimulation will eventually spread to all the other parts of that kind of nervous system. Massage the Vishuddha Chakra hard and/or long enough and its stimulation will eventually spread all the way down to the Muladhara chakra, sexual asphyxia. That was called Gomory, the sin of Gomorrah. Scar tissue in the sympathetic nervous system will keep that whole kind of nervous system stimulated in the unpleasant disease called Reflux Sympathetic Dystrophy. Scar tissue in the parasympathetic (muscarinic) nervous system causes a disease the old antisuperstitious Soviet Union called “Shamans’ Disease”, which in the superstitious West has been suppressed under the tag of schizophrenia. IT has nothing to do with oxygen content, it is the physically stimulated muscarinic nervous system awakening the brain more than normal. Witches seek the mental powers, magickal powers, of the Second Level. In there your visualizations, held by your will, manifest as reality. That is magick power. When the power gets out of hand you have entered the Third Level which is Hell itself. You can spend a thousand years in there and return before you left. Some of us (there are several of us in here) have spent more than 99% of our time in Hell. You could call us real Hellians, “explorers in the further regions of experiance, demons to some, angels to others”, for real. I was also Ninth Degree – Second House in the Clerics of Azagthoth. If you Google about this, you will see that we engraved this Secret in zinc and steel disks and scaled thousands of them out our car windows all over eastern Massachusetts. Coincidently, others, who have been around, also attained the Third Degree of Witchcraft and were assigned to be High Priests of their Local Covens, for, these covens are mostly composed of women, and High Priests are scarce. It’s a very pleasurable position. And, the highest degree most attain in the Clerics of Azagthoth is the Ninth Degree – Second House, for, in order to be an Ipsissimus, Tenth Degree – First House, you have to be impervious to pain. Forget it! The White Right Hand Path (known as orderly evil) has tried to exterminate the Black Left Hand Path (known as chaotic evil) since time immemorial. THEY say “Ordo Ab Chao”, and the Black Left Hand Path says “Chao Ab Ordo”. THEY suppress profane vagal stimulation to maintain THEIR order, and force THEIR civilization on the people. Being on the run, I haven’t had time to look up the exact chapter and verse. It’s in there. Just ask any Christian minister. It’s why Christianity has been spread around the world so vehemently; but, they missed the Secret. I have never met a Christian who knew what the cross really does. It’s a touchy subject, so I haven’t asked any, yet. The name Montgomory, refers to the “mountain of initiation” where candidates for initiation were introduced into the Underworld this way. thats some pretty enlightening information on the underworld there Miguel. Maybe you should enlighten a therapist on your theories. Wow that is cool. I didn't know that there was a thing called White bark Raspberries, until a friend told me to look it up and help him see if Blue Raspberry are real.